Posted on 26 September, 2018 at 11:11 am. At WaveLength, we are delighted to welcome Age UK’s newly-released research ‘All the Lonely People: Loneliness in Later Life’. The report shows that there are several reasons why people feel lonely at different points in their life. Loneliness is universal regardless of age. It is important to offer personalised emotional and practical support. Combatting loneliness requires more than providing social activities, but enabling individuals to feel confident and empowered. Every situation is different, so it is crucial that we listen to individuals and offer creative solutions. Our existing work with beneficiaries highlights the importance of trusted community members and professionals. They recognise and help people who are lonely and have referred people to WaveLength so they can apply for a radio, television, or smart tablet. “It [having a radio] opens up conversations to people, they feel emotionally more attached to the world, they know what’s going on more, and it certainly does help…mental well-being because they’re not in an empty, lonely house. It’s got a bit of life to it…you’ve got a bit of music and a bit of song and chat and whatever, and it sort of changes the whole concept of the house”. We look forward to continuing our work to combat loneliness in collaboration with a range of partners around the UK. For 80 years, WaveLength has led the way with delivering change for lonely and isolated people through the use of media technology. For people who are lonely, a radio or television can feel like a lifeline. 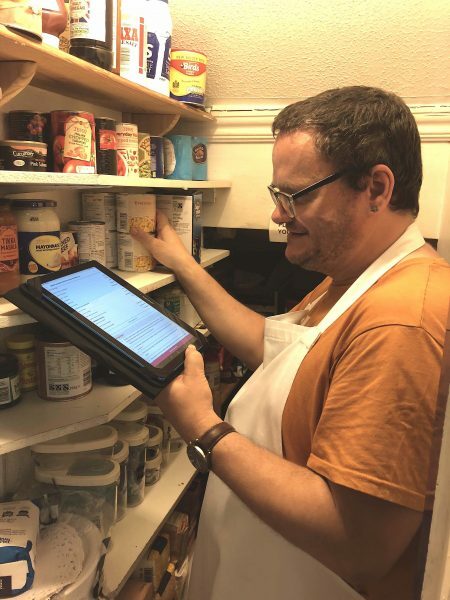 Image: Beneficiary at Dial House using a tablet, given by WaveLength, to help find ingredients to use for recipe.